Porcia Catonis (c. 70-43 BCE) was a prominent female figure at the end of the Roman Republic noted principally for her impressive familial and marriage connections. She was the daughter of Marcus Porcius Cato Minor, also called Cato Uticensis (95-46 BCE), and his first wife, the reportedly disreputable Atilia (born c. 90 BCE), whom, according to Plutarch, Cato divorced, marrying in her stead Marcia, daughter of Philippus (Cato Minor 7.3, 24.2-25). Throughout her life Porcia was to prove a worthy daughter of the staunch Republican Cato, whose political values she dutifully supported. Her first husband, Marcus Calpurnius Bibulus, was a fierce opponent of Julius Caesar both as his co-praetor in 62 BCE and again as his co-consul in 59 BCE. Since she successfully produced sons in her marriage to Bibulus, Porcia's father Cato was approached by his friend, the famous orator Quintus Hortentius Hortalus, seeking permission from Cato to marry her so that she could bear him children. Cato refused to grant his daughter, but, with his father in law's approval, he divorced his wife Marcia and gave her in marriage to his friend (see Marcia's response in Lucan's Bellum Civile 2.326-371). Porcia was widowed in 48 BCE, when Bibulus died from illness while fighting on Pompey’s side against Caesar in their civil war. Porcia’s second marriage, to Marcus Junius Brutus (85-42 BCE), the son of Cato’s half-sister, Servilia Caepionis, in 45 BCE, caused a scandal in Rome (see Cicero, ad Atticum 13.9-10), for not only did Brutus suddenly divorce his first wife, Claudia Pulchra Maior, a member of the powerful gens Claudia, but shortly after his divorce he married his cousin Porcia. 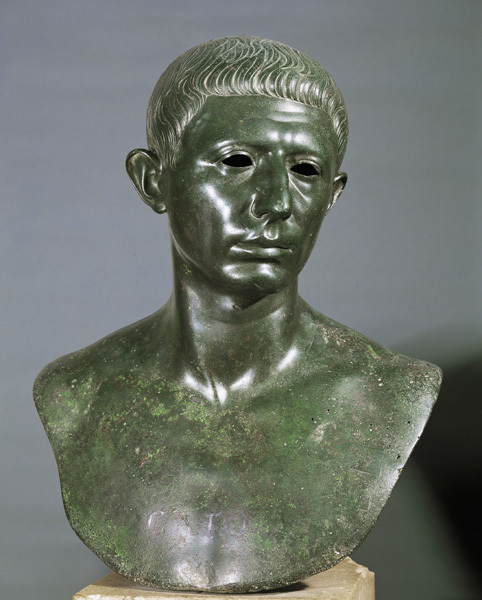 Furthermore, having only just been reconciled with and promoted by Caesar, this marriage joining him to the family of Caesar's foe was seen as an act of Republican defiance. Porcia proved as loyal a wife as she was a daughter; her second marriage was remarkable for its mutual affection and admiration rather than its political convenience. Strong-willed and dedicated to the Republican cause, Porcia clashed with her mother-in-law Servilia (Cicero, ad Atticum 13.22) who, as Caesar’s former lover, harboured different political designs for her son. Porcia played a pivotal role in the conspiracy against Caesar, encouraging Brutus to murder the dictator by slashing her own thigh to prove her willingness and ability to support him in his act (Plutarch, Brutus 13, Valerius Maximus, Factorum et Dictorum 3.2.15), though she is portrayed by Plutarch as being overcome by uncharacteristic fears while awaiting news of Caesar's assassination (Brutus 15). Continuing her involvement in political affairs after Caesar's assassination, Porcia was present when the Liberators met at Antium in June 44 BCE (see Cicero, ad Atticum 15.11). Plutarch describes her as unable to suppress her anguish at being separated from Brutus as he departed from Italy, weeping inconsolably at a painting of a similarly-fated couple, Hector and Andromache (Brutus 23). It is difficult to discern the real person behind representations of Porcia as the loyal Roman matrona. Reliable contemporary evidence suggests that she became ill and died, possibly by suicide, in mid-43 BCE, over a year before Brutus’ suicide after the Battle of Philippi (see Cicero, ad Brutum 1.9 and ad Brutum 1.17; Plutarch, Brutus 53). The few episodes depicting her life endow her with legendary status. Even the poet Martial portrays Porcia in the passage below as the heroic embodiment of wifely grief upon separation from her husband, grimly fixated on death (see Valerius Maximus' tribute to Porcia in The Worlds of Roman Women, p. 53: Factorum et Dictorum 4.6.5). The poem is a brief six lines long, written in elegiac couplets. For more about Servilia and the elite women of the end of the final century of the Republic, see Treggiari (2019) in the Bibliography. "Nondum scitis" ait "mortem non posse negari? Credideram fatis hoc docuisse patrem." 5 Dixit et ardentis avido bibit ore favillas. Click on the underlined words for translation aids and commentary, which will appear in a small window. Click on the icon link to the right of the poem for related images and information.